The equivalent suction lift is equal to the difference between the “vacuum effect” and the net submergence. This is the fifth article in a five-part series. Click to read parts one, two, three and four. In the first four parts of this five-part series, we covered the calculation of NPSHa for a flooded suction, a lift condition, a hot water flooded suction and a pressurized hot water flooded example. In this fifth and final working example, we will investigate what happens to NPSHa when the system is under vacuum. What if I told you that vacuum is pressure? Most people would surely dismiss that statement as silly, but please think about it. In a vacuum, there remains an amount of pressure that is below atmospheric pressure, but is also above absolute zero. Even in a container at “middle to high vacuum” there is some pressure remaining. The application example for this article is a steam condenser. Condensers operate in a vacuum by design because this approach maximizes efficiency for the steam system. If you are applying pumps in commercial or industrial applications, you will eventually encounter a situation where the liquid on the suction side of the pump is under vacuum. Condensers are not the only applications concerned with vacuum. The pressure in the suction line of a centrifugal pump operating in a lift application will most often be in a vacuum—that is, at a pressure less than atmospheric. To be clear, when we state a pressure, we should add the mode to differentiate the pressure measurement we are referencing. That is, we should state with the units and measurement quantity the correct mode; either vacuum, atmospheric, gauge or absolute. For this article, we will refer to the area of vacuum as that pressure range (mode) below atmospheric pressure and above zero pressure absolute. Note that atmospheric pressure changes with the weather (barometric pressure) and the elevation above or below sea level. To help in understanding the next part of this example, I will add a few comments. Atmospheric pressure at sea level equals 14.7 pounds per square inch (psi) and that equates to a pressure of 29.92 inches of Hg (mercury). To convert inches of mercury to units of feet, multiply by 1.1349. For those that deal in SI units or work professionally in the vacuum arena, note that a Torr is defined as 1/760 of an atmosphere and may be expressed as 1 mm-Hg, where 760 mm-Hg also equals 29.92 inches Hg. Also in what appears to be an evil plot just to confuse the neophytes, we reverse the scale when we switch from pressure to vacuum. When we use the expression “full vacuum,” we are referring to the vacuum level of 29.92 inches of Hg. Note we state full vacuum and not a perfect vacuum. At full vacuum, there is no pressure remaining for the NPSHa calculations. The mistake most often made in vacuum applications is thinking the level of vacuum is the same as the pressure and that the units just need to be converted. 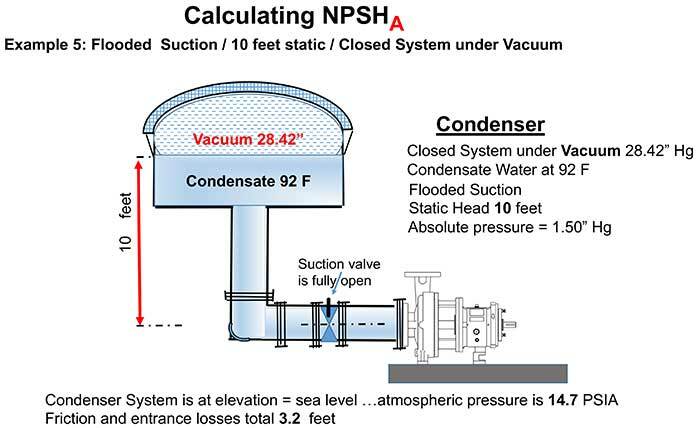 Further, when the person calculating the NPSHa for the system is looking to determine the value of the first component in the NPSHa equation (which is ha or habsolute) many people just convert the vacuum measurement to feet of water and use that result in the equation. That approach will yield the wrong answer. For example, 28 inches of mercury vacuum converts to approximately 32 feet. The correct answer is discussed later. For the correct answer, we first need to determine the amount of residual pressure in the condenser. Then use the formula to calculate the resultant NPSHa. I know many of you hate formulas, and I will remain insistent they are your friends. Refer to Image 1, which depicts the condenser application for this example. The application is at sea level. The condenser is operating at a vacuum of 28.42 inches of mercury (28.42”-Hg). Note we are measuring vacuum so the scale is now reversed from our normal perception of pressure. The higher the vacuum, the closer we approach the maximum or full vacuum of 29.92” Hg. At zero or low vacuum, the measurement would be 0” Hg.